– Adolescent Substance Use: America’s #1 Public Health Problem, June 2011. National Center on Addiction and Substance Abuse at Columbia University. – Aveyard, P., Markham, W. A., Lancashire, E., Almond, J., Griffiths, R., & Cheng, K. K., (2005). Is inter-school variation in smoking uptake and cessation due to differences in pupil composition? A cohort study.Health and Place, 11, 55-65. – Bishop, D. et al (2013). Measuring Fidelity and Adaptation: Reliability of an Instrument for School-Based Prevention Programs. Evaluation & the Health Professions 2014. – Catalano, R.F., Haggerty, K.P., Oesterle, S., Fleming, C.B., -Hawkins, J.D. (2004). The Importance of Bonding to School for Healthy Development: Findings from the Social Development Research Group. Journal of School Health, Sept. 2004, Vol. 74, No. 7, 252-261. – Evans-Whipp, T., Beyers, J. M., Lloyd, S., Lafazia, A. N., Toumbourou, J.W., Arthur, M. W., (2004). 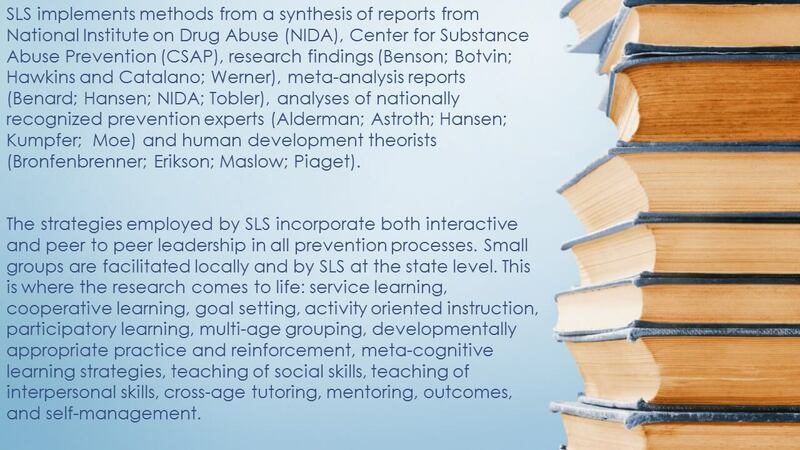 A review of school drug policies and their impact on youth substance abuse. Health Promotion International, 19, 227-234. – Flay, B.R., & Petraitis, J. (1994). The Theory of Triadic Influence: A new theory of health behavior with implications for preventive interventions. Advances in Medical Sociology, 4, 19-44. – Gambone, Michelle. (2005) Youth Development Strategies, Inc. Youth Survey Report for Student Leadership Services, Inc., May. – Garbarino, James. (2002) And Words Can Hurt Forever, How To Protect Adolescents from Bullying, Harassment, and Emotional Violence. Free Press. – Hansen, W. et al (1993) Prevention Programs: Factors That Individually Focused Programs Must Address. Educational Leadership. 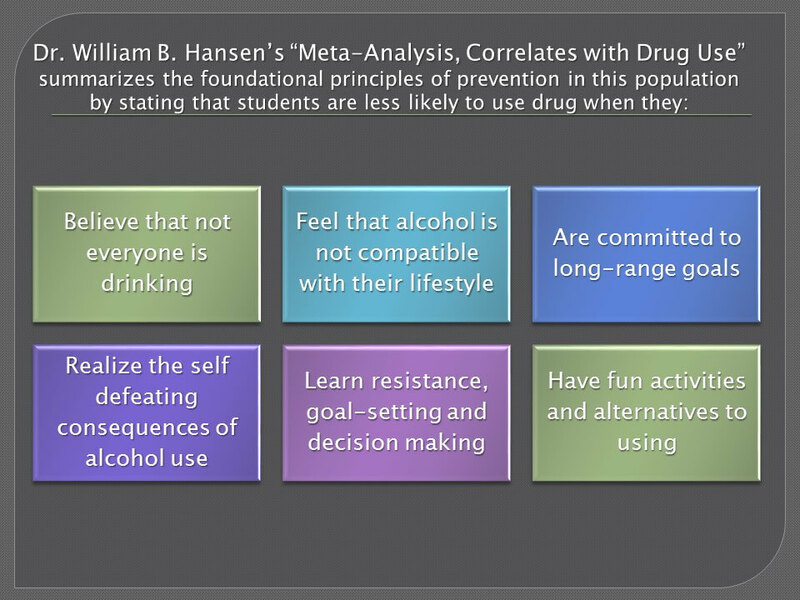 – Hansen, W. et al (2010) Operating Characteristics of Prevention Programs: Connections to Drug Use Etiology. American Psychological Association. – Hawkins, J.D., Catalano, R., Miller, J. (1992) Risk and Protective Factors for Alcohol and Other Drug Problems in Adolescence and Early Childhood: Implications for Substance Abuse Prevention. Psychological Bulletin, 112. – Hawkins, J.D. (1998) Raising Healthy Children: The Communities That Care Approach. Prevention Research and Community Intervention: A Collaborative Conference Involving University Scholars and Community Leaders. University of Michigan, Substance Abuse Research Center. – Kosterman, R. et al (2014) Young Adult Social Development as a Mediator of Alcohol Use Disorder Symptoms from Age 21 to 30. American Psychological Association. – “Meta-Analysis of Adolescent Drug Prevention Programs: Results of the 1993 Meta-Analysis.” National Institute on Drug Abuse, Research Monograph 170. – Search Institute. (1997) Developmental Assets: A Framework for All Youth. 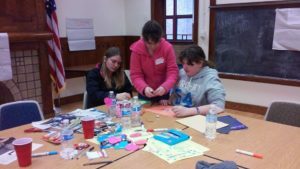 Healthy Communities, Healthy Youth: A National Initiative of Search Institute to Unite Communities for Children & Adolescents.” Resiliency In Action, Winter. – Smith, Charles. (2005) Youth Program Quality Assessment (YPQA); SLS Score Report. HIGH/SCOPE Educational Research Foundation, November. 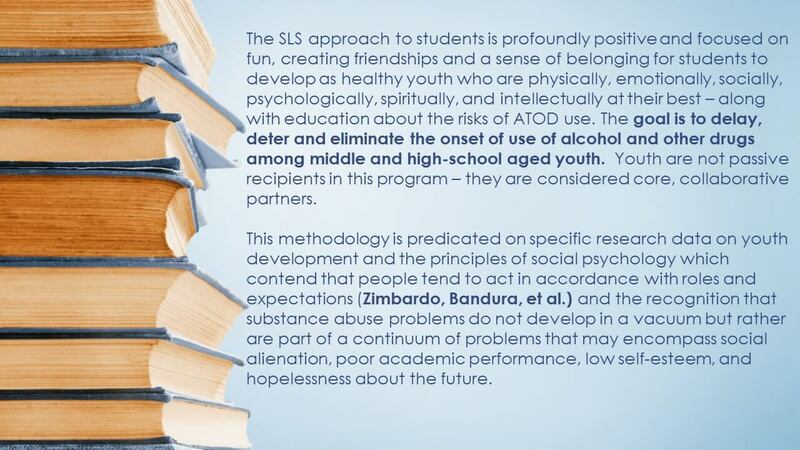 – Tobler, A. L., Komro, K. A., Dabroski, A., Aveyard, P., Markham, W. A., (2011) Preventing the Link Between SES and High Risk Behaviors: “Value-Added” Education, Drug Use and Delinquency in High Risk, Urban Schools”, Society for Prevention Research. Online.